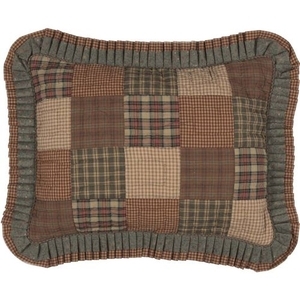 VHC Crosswoods Standard Sham 21x27, Available Now! The Crosswoods Sham takes inspiration from a well-traveled crossing where fields of flowers meet centuries-old forests. Plaids, microchecks, and delicate floral patterns are crafted together in tan, blue, and red to create a Primitive combination of comfort and beauty. 100% cotton, hand-quilted patchwork, reverses to floral print found on the border, and finished with pleated ruffles.